Simultaankerk is the Dutch for a “simultaneous church” – which is a multi-denominational chapel. I am on a business trip to Jakarta at the moment and because the regular hotels we use are booked solid ((well, except for the presidential and honeymoon suites but at about $500 a night the boss wasn’t happy with those options)) we went to www.ratestogo.com.au and booked last minute into the Park Lane Hotel. The Park Lane is on Jalan Carablanca in Jakarta and is a 5-star hotel of better quality that the ones we usually use. We also got the room cheaper. So, I checked in after spending the required 2 hours or so in traffic from the airport (average speed, 10 kilometres an hour), went to my room and had a quick look out the window before changing my in-flight meal stained shirt ((Sir Les Patterson comes to mind)) and heading out to the first meeting of the afternoon. The picture above is from my room window. I got back tonight and started to look it up. The crosses in neat military rows and the manicured lawns immediately said war cemetery. 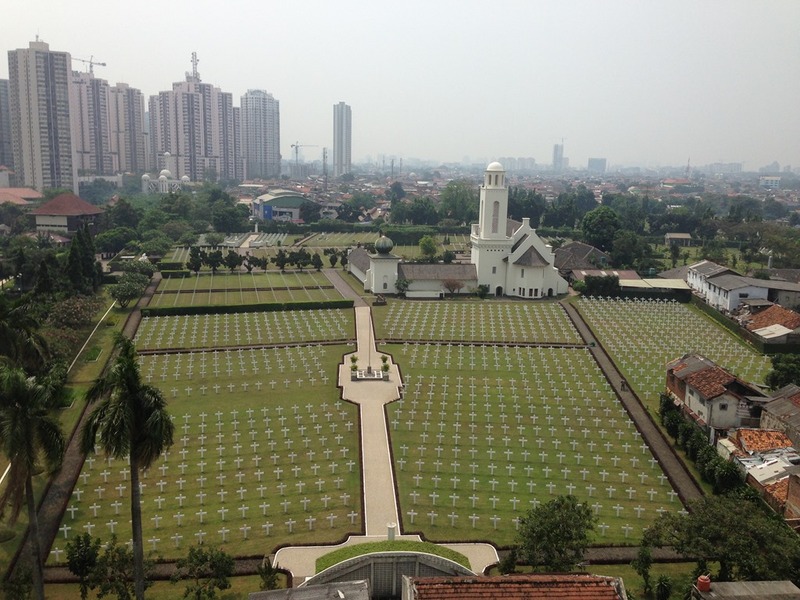 A quick look in Google maps as well as the Maps2go app on my phone and I found it is part of the Commonwealth war Cemetery in West Java, in Jakarta. The area I look out on is the Dutch area of the cemetery.